The Atlantic salmon that were spilled into Puget Sound in a major net-pen farm escape at Cypress Island in August appear to be gone, with the fish not turning up in stream surveys by state biologists or in fall fisheries. "Most people here presume they are dead and gone," said Tony Meyer, spokesman for the Northwest Indian Fisheries Commission, representing the treaty tribes of western Washington. "They were not feeding or anything; they were not going to make it. Of course miracles always happen, but mostly we figure they all died. "They scattered everywhere, one showed up a few weeks ago, that is about it. They are just not turning up and they are not expected to." 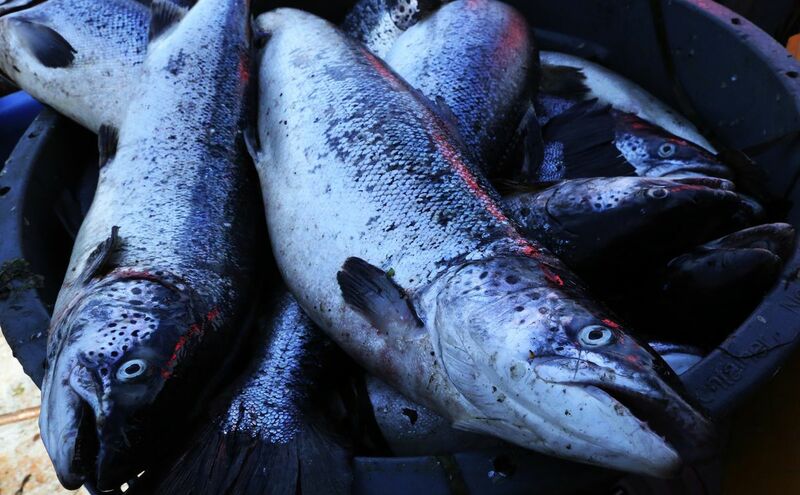 Bruce Botka, spokesman for the Washington Department of Fish and Wildlife, said the most recent report of an Atlantic salmon being caught was Oct. 25, in a nontreaty gillnet fishery near Port Madison. That salmon had no signs in its stomach of having fed or foraged since escaping the net pen at Cypress Island, Botka said. Cooke Aquaculture, the owner and operator of the farm, also reported that the hundreds of escaped salmon it captured all had empty stomachs. "It would seem, from a biological point of view, that the likelihood of many more fish surviving is diminishing by the day," Botka said. "Without a consistent food source, their fat reserves can only last so long before they become food for crabs or other bottom feeders. "We have seen no evidence to date that indicates the escaped fish developed an appetite for traditional salmon forage." It is, and will remain, impossible to know precisely what happened to the roughly 100,000 escaped fish that dispersed all over Puget Sound and beyond and were never accounted for. The Lummi Nation launched an emergency fishery that netted more than 400,000 pounds of Atlantics. But meanwhile, the political consequences of the escape are just starting, with a legislative work session on the net-pen collapse this Wednesday in Olympia, and the first lawsuit filed against Cooke on Monday. Wild Fish Conservancy filed a citizen suit against Cooke under the Clean Water Act alleging the company was negligent in releasing the farmed Atlantic salmon into public waters. The net-pen collapse at the Cypress Island Farm, one of eight that Cooke operates around Puget Sound, "resulted in the discharge of farmed Atlantic salmon, dead fish carcasses, and massive amounts of debris among other pollutants," the conservancy stated in news release about the suit. In addition to seeking fines against Cooke for violations of its permits, the conservancy is commencing independent testing of some of the Atlantics captured by the Lummi Nation for disease and toxins. Nick Gayeski, fisheries scientist at the conservancy, said the escaped fish pose a risk to depressed populations of wild native salmon and steelhead. This was not the first escape of Atlantic salmon in Washington waters, or the largest. Yet as far as invaders go, Atlantics are remarkably unsuccessful: There has never been a documented established run of Atlantic salmon in Washington — even after the state Department of Fish and Wildlife's earlier attempts to establish an Atlantic salmon fishery. Large-scale attempts to establish runs in British Columbia have been similar duds, and the fish have also failed to colonize streams in Chile, despite millions of escaped Atlantics over the years. Yet scientists warn the Atlantics pose risk to native stocks in the Puget Sound because of the potential for competition. And while escaped Atlantics haven't established here so far, that doesn't mean it can't happen, or that there is no risk posed by Atlantics, wrote Peter Bisson, a research fish biologist in the Pacific Northwest Research Station in the Olympia Forestry Sciences Lab of the U.S. Forest Service. In a white paper published by the U.S. Forest Service Bisson wrote that risk to native Pacific salmon in Washington from farmed Atlantic salmon either as vectors of disease, competitors for food, or establishing in Washington streams rises with repeated escapes. All Western Washington treaty tribes have called for a ban on net-pen aquaculture of Atlantic salmon to protect native stocks. "These fish need to go," Meyer said. "It is the risk, the uncertainty." Cooke has apologized for the escape, and called it "primarily a business loss." The lawsuit was filed in U.S. District Court for the Western District in Seattle. Attorneys for Cooke are reviewing the suit and had no immediate comment, said Paul Queary of Strategies 360, a communications consultant for Cooke.